Axalto will be providing cards and readers as part of the national ID program of Qatar, a middle eastern country bordering Saudi Arabia. The fingerprint match-on-cards will be given to every Qatar citizen above age 16 and will include personal data as well as the person’s fingerprint. The cardholder will be able to access e-government services and perform transactions securely using an Axalto smart card reader connected to his or her home computer. Amsterdam / Doha–Axalto, the world’s leader of microprocessor cards, announced it will contribute to the Qatar national ID program with the delivery of fingerprint match-on cards, associated readers and services. Qatari citizens will use these high-end cards, combining a built-in biometrics feature, contact and contactless technologies as their national ID document as of the first quarter of 2007. 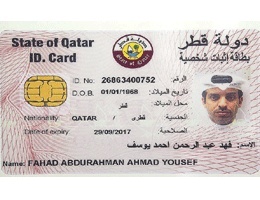 This smart card, the size of a credit card, will serve as the official ID document for Qatari citizens above 16, as well as foreign residents. In addition to the personal data available in usual ID documents (such as name, birth date, address etc), the microprocessor will also store the person’s fingerprint. The biometric data remains on the chip and never leaves the card even when the identity verification is being performed, respecting privacy of the cardholder. Thanks to the security features embedded in his/her ID card, the cardholder will be able to access e-government services and perform transactions in a simple and secure manner. Using an Axalto smart card reader connected to their home computer, citizens could use their smart ID card to declare a household employee, change of address, or obtain civil records (http://www.moi.gov.qa). Moreover, the contactless technology built in the card together with the match-on card capability allows this ID card to be used as a travel document, increasing speed, convenience and security of identity verification at border crossing. “For the Qatar national ID program, Axalto provides a comprehensive and multi-application smart card based solution that clearly benefits both the Ministry of Interior of Qatar and the card holder: security in the identification of the cardholder, convenience when crossing borders, and trust when accessing egovernment services” added Olivier Piou, chief executive officer of Axalto. Axalto is the world’s leading provider of microprocessor cards (Gartner 2005) – the key to digital networks – and a major supplier of point-of-sale terminals. Its 4500 employees come from over 60 nationalities and serve customers in more than 100 countries, with worldwide sales exceeding 3 billion smart cards to date. The company has 25 years’ experience in smart card innovation and leads its industry in security technology and open systems. Axalto continuously creates new generations of products for use in a variety of applications in the telecommunications, finance, retail, transport, entertainment, healthcare, personal identification, information technology and public sector markets. Microprocessor cards provide convenience, security and privacy to public and private services operators, their customers and end users. For more info, please visit www.axalto.com.